Together with the Livingston FFA, Wildlife Services, MT FWP, NRDC, People and Carnivores and local ranchers, we set up fladry around two different calving pastures in Tom Miner this year. This deterrent for wolves was applied at the onset of calving on each ranch and was taken down approximately 4-6 weeks later. We had no livestock losses due to predation on either of these ranches in the Basin this season (these were the only two ranches calving in the Basin). This is our second year seeing such success and fourth year seeing such success when cattle have been contained within the fladry. Combined with fladry, each calving area had a high and consistent amount of human presence 24/7 from ranchers. Although wolves and bears were observed on the ranches while calving was occurring, no bears or wolves were observed in contact with cattle or the fladry. Fladry was maintained throughout the season by volunteers, ranchers and range riders. Over 2014 and 2015 we had some unique opportunities to observe wolves interacting with the fladry or responding to fladry by leaving the area once the tool was applied. Although we did not have such observations this year, the positive results were still the same and we continue to place high value on this tool as a deterrent for wolves around calving pastures. Cattle began arriving back in the Basin throughout this month and we began range riding on May 15th. This season we have 3 part time riders working for the program. Each rider rides early morning and late evening, increasing human presence around cattle and gathering cattle where possible, making sure calves are with mother cows and all cattle are out of thick brush and willows. Riders have also spent time tracking wildlife, especially wolves, in effort to gain accurate information about how our local pack continues to use the landscape. With a high count of 12 wolves last winter, this pack size is beyond what many consider sustainable when located in such close proximity to livestock. At this time we suspect that several individuals from this pack have likely dispersed into neighboring pack areas or beyond. On occasion riders have found wolves in close proximity to cattle but there have been no known conflicts so far. In one instance, in late evening, riders watched a single wolf chase a single elk across a field and right by a herd of well gathered cattle. The wolf and elk continued the chase as the cattle stood by and watched. As the wolf went out of sight, the cattle returned to grazing, appearing to be unbothered. All cattle continue to be working well as herd units, in part due to consist handling and gathering and in part due to the cattle’s natural tendency to stay together and be attentive to their calves. Grizzly bear sign and sightings is slowly increasing with high amounts of bear sign being found on the FS permits. Bear sign and sightings also remain consistent throughout the entire Basin. No cubs of the year have been reported but there have been several sightings of “young” grizzly bears on their own (estimated by the observer to be about 3 years old) on the South side of the road as well as a few reports of sows with 2 and 3 large cubs. One adult boar has been seen, tracked and caught on field cameras on several occasions on the South side of the road as well. Range riding is about a relationship - one that is cultivated by hours and days spent observing, moving, and being present on the landscape during the most tender hours of the day. 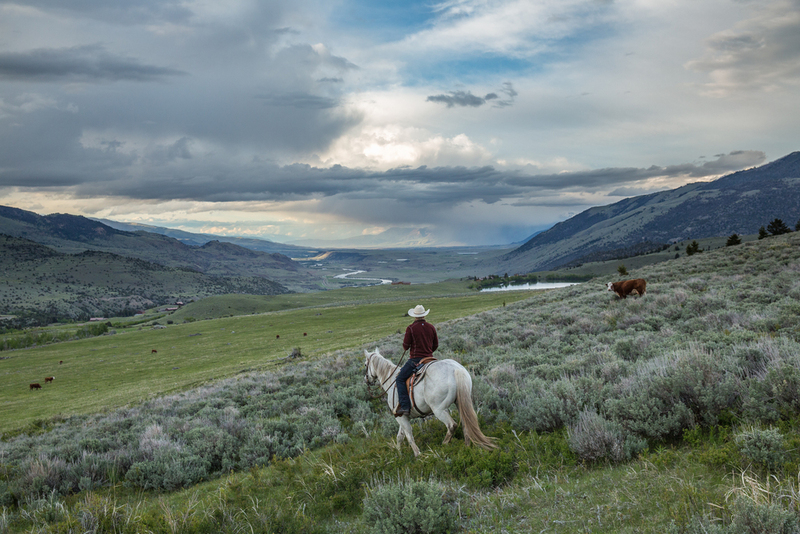 A range rider’s job is to strike a balance, to understand the patterns and rhythms of Tom Miner Basin, as creatures, wild and domestic, human and non-human, come and go. Daniel and Dre, Tom Miner's two seasonal range riders, began honing this relationship on May 15, on the brink of springtime. Calves are alive and figuring out how to keep track of their mothers; elk are feeding on springtime's green grass; sandhill cranes are picking up twigs and worms in the lush soil while calves dumbfoundedly observe; Niles the foster calf spends the day awaiting his next bottle-fed meal; horses are remembering what it feels like to be caught; wolves are yet to be seen; and bears are sneaking into the dog food bin on the porch of the Anderson house. And the humans? We're in and amongst it all. Throughout the 2016 range riding season, photographer Louise Johns will be generating a combination of photo, video and writing content as updates from the field.The blog is meant to be a personalized, but objective account of life on this range. She will focus on documenting the changes and successions of this landscape, and how the livestock, wildlife and people are affected. Her goal with this project is to show what is happening on the landscape, and the people who are dedicated to keeping it a healthy, thriving place for all forms of life. In one of the most beautiful places in the world, there is a great story to tell. Louise's work is funded by a Young Explorers Grant from National Geographic, and other contributors to Tom Miner Basin Association.